She covers all sorts of great embellishment ideas. It's richly photographed with both in progress pictures and the incredible finished projects. My favorite project is probably the tart tin ornaments. Her examples may be seasonal, but the techniques themselves can be used in so many ways. From a jolly snowman ornament and feathery winter banner to ornate Easter eggs, fabulous bridal corsages and spooky cat ornaments, readers will find projects they want to make, as well as techniques they can use again and again! It's a mixed media techniques book with a seasonal theme. There is also a good resources list, and a complete index to find things fast. Just not a good match for me. So gather your supplies, add a dash of inspiration and maybe some glitter and delight in the seasons with Lisa Pace! You'll create beautiful projects and embellishments using a wide variety of both everyday and unexpected materials, while paying homage to your fondest memories of Christmas, summer vacation, Halloween and more. It's a mixed media techniques book with a seasonal theme. Lisa Pace is at it again, this time with projects and techniques that will have you celebrating the seasons in style! Each project is to illustrate the use of one technique that can be used in all sorts of ways. You'll create beautiful projects and embellishments using a wide variety of both everyday and unexpected materials, while paying homage to your fondest memories of Christmas, summer vacation, Halloween and more.
. While I usually like a bit of asymmetry, some of these designs seemed just plain ol' unbalanced. Author Biography Lisa Pace is the author of Delight in the Details and a 2008 Memory Makers Master. Author: Lisa M Pace Publisher: Cincinnati : F+W Media, 2012. 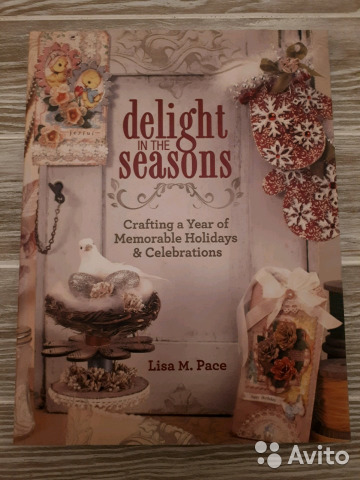 So gather your supplies, add a dash of inspiration and maybe some glitter and delight in the seasons with Lisa Pace About the Author Lisa Pace is the author of Delight in the Details and a 2008 Memory Makers Master. Pace's book Delight in the Details. As a companion, pick up Lisa's first book, Delight in the Details. So gather your supplies, add a dash of inspiration and maybe some glitter and delight in the seasons with Lisa Pace! Lisa Pace is at it again, this time with projects and techniques that will have you celebrating the seasons in style! These two books are sure to become staples on your papercrafting inspiration bookshelf! A delightful variety of sample projects including home, seasonal and party decor, greeting cards, ornaments, scrapbook layouts and more. Delight in the Seasons is just as good. If you're more interested in mixed media decorations and gifts, you'll get ideas for those as well. She covers all sorts of great embellishment ideas. One of my favorite pieces is a patriotic star that can be hung on a wall or put on a base to put on a shelf that uses bottle brush trees and her method for dying them. Let Lisa and her pretty vintage style inspire you with techniques that will expand your perceptions of what papercrafting can be. I found that many of the actual projects were not something I would re-create, but was definitely inspired by her attention to detail and seeing how the pieces she created came together in the end. In Delight in the Seasons you'll find: 40 step-by-step techniques, to be used as demonstrated or adapted to meet your style and needs. In Delight in the Seasons you'll find: 40 step-by-step techniques, to be used as demonstrated or adapted to meet your style and needs. Key Features Author s Lisa M.
Techniques include various ways to work with chipboard, embroidery, air dry clay, ultra-thick embossing enamel and modeling film. Lisa Pace is at it again, this time with projects and techniques that will have you celebrating the seasons in style! The embroidery technique to create a felt banner can be used instead to create a bunting. It's richly photographed with both in progress pictures and the incredible finished projects. This is as good as the first book. The instructions are clear and easy to understand. She shows them as Christmas ornaments, but I'm thinking as little dioramas that can be displayed all year. Lisa Pace is at it again, this time with projects and techniques that will have you celebrating the seasons in style! Description Make each season delightful Lisa Pace is at it again, this time with projects and techniques that will have you celebrating the seasons in style Let Lisa and her pretty vintage style inspire you with techniques that will expand your perceptions of what papercrafting can be. If you're not familiar with Lisa Paces' style, it is heavily vintage. You don't need to be able to draw or sculpt to create art. The projects have a lot of texture, visual interest and sparkle. You'll create beautiful projects and embellishments using a wide variety of both everyday and unexpected materials, while paying homage to your fondest memories of Christmas, summer vacation, Halloween and more. Each project is to illustrate the use of one technique that can be used in all sorts of ways. There are some great pieces for putting on a mantel or shelf. Pace also likes to use random print or staffs of music for one of her layers, which I don't like, and, while I like the occasional project with an antiqued effect, Pace clearly likes browns and neutrals and faded colors a lot more than I do. In her pretty, vintage, glittery style, Lisa demonstrates 40 great techniques, just as she did in her first book Delight in the Details. Delight in the Seasons : Crafting a Year of Memorable Holidays and Celebrations. While each project focuses on one element, the finished projects have a list of the supplies used to create them with the companies listed to make finding components a lot easier. Pace also likes to Victorian-influenced stuff often appeals to me, and I find it inspiring, but I found most of these projects oddly incoherent. Used in a masculine page layout in the book, the same technique could be used on other shapes to create pieces that look like cloisonné. Delight in the Seasons is just as good. If you're a scrapbooker, a lot of these techniques will work to create wonderful pages and album covers. The E-mail message field is required. If you' I loved Lisa M.